This Thursday’s Spirit Moves is a special one. 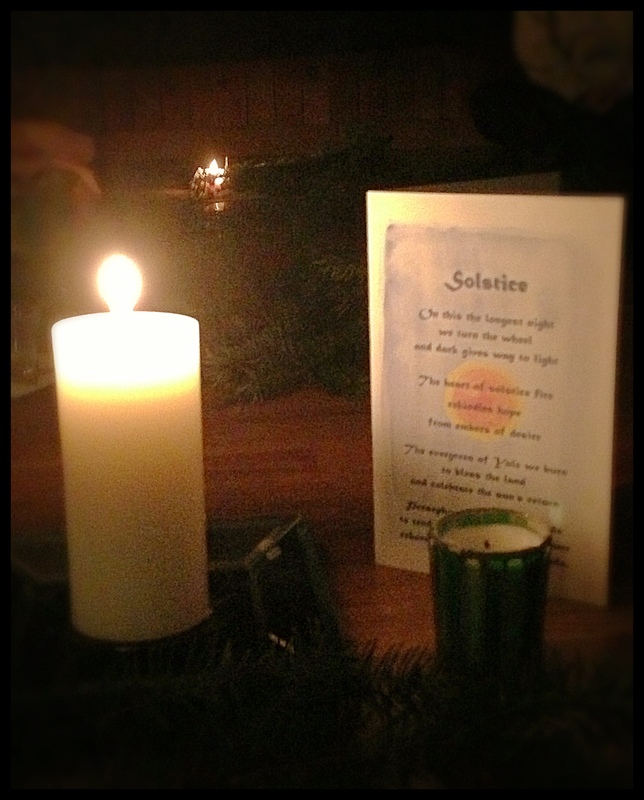 It is not only our last dance of 2013 but it is also a Winter Solstice celebration. 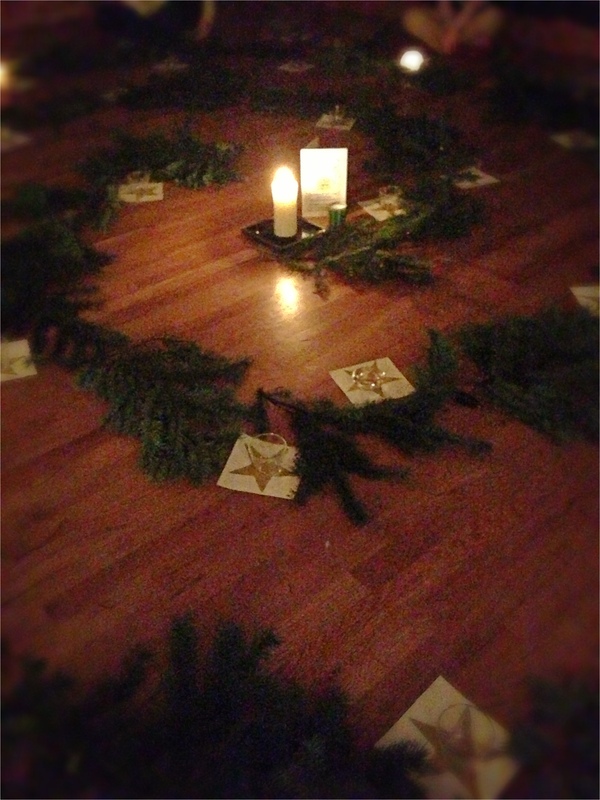 The evening is a sacred co-creation (including songs suggestions by many of you), a crystal bowl meditation offered by Yvonne, and with the help of Wendi and others, we will be creating an Advent Spiral, with evergreen branches. Each of us will have an opportunity to walk through the spiral and light a candle at the central flame. As we travel into the spiral, we may also travel into ourselves~ a symbolic journey to our own central flame. Because at the heart of us all is a beautiful divine light. During this walk, it is up to you to find your own meaning, to set your own intentions or dreams. Winter solstice marks the shortest day of the year. We acknowledge this darkness while we joyously celebrate the sun’s slow and steady return. It is an opportunity for spiritual renewal, and an embracing of hope through the darkness as the days once again begin to grow longer and warmer. Love may spread o’er all the Earth. I invite you all to come and light a candle. Let’s move our bodies in celebration our own divine light and for the light we see in each other. When we shine brightly, we illuminate the path for others to shine too. 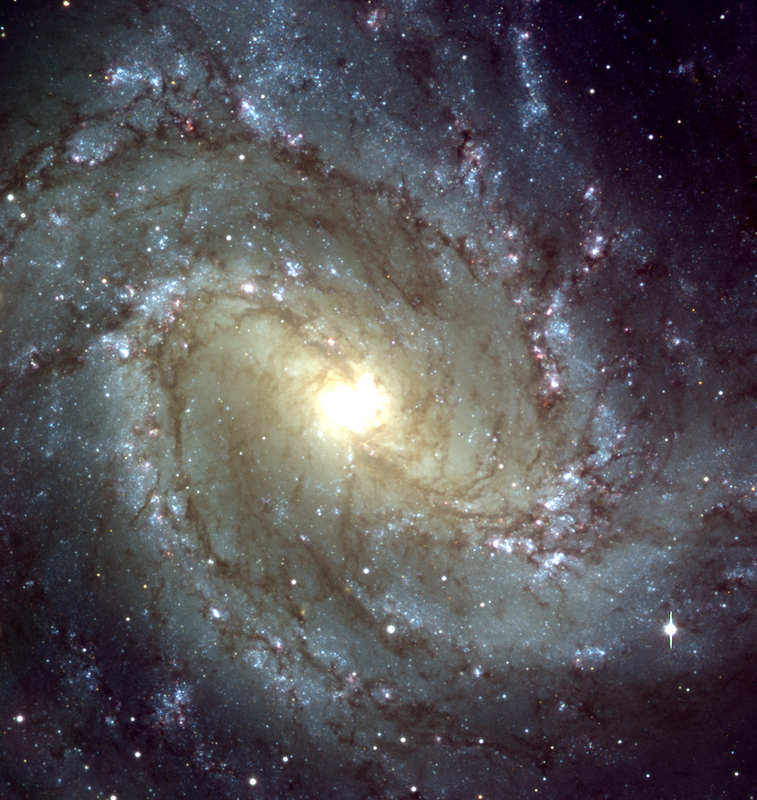 I’m sure happy to spin around and around in this spirally galaxy (and on the dance floor) with you all. It was a beautiful night, with the reverberating sounds of six crystal bowls being played rotationally as people walked through the spiral. Thank you Joanne, for these inspirational words and super swirling and joyful music to dance to. Thanks to everyone who made the evening shine. Indeed, the arrival of this time of year provides opportunities for us to step out of the routine of daily life and reflect on the greater values that we hold for ourselves and for the world. It has taken me many years of feeling caught in a dualistic drama surrounding Christmas to be finally moving into the direction of creating the kinds of traditions that support the values and emotions that I long for at this time of year. While I trudge through the rituals that our North American society, media, and religion have handed to us, and attempt to surround myself and family with ways that feel true for me, there is a motivation to find beauty and deep connection to the light of the spirits of the people around me. This year I feel particularly strong about creating Christmas with a certain emotional field for myself and for my family. It seems like a great window to let in beauty, connection, laughter, joy, love, gratitude,the timelessness of days, simplicity, and prayers of peace for the world. I find myself yearning to create this certain atmosphere, and filling myself up with warmth and the importance of being together. I struggle with fitting these energies into the physical manifestation of the traditional ways that are expected, and sometimes feel that my hesitations to replicate what everyone else is doing may cause disappointment or misunderstandings. How do I translate this to those around me in an honest way through such acts as giving a physical gift… a gift of the thoughts of my heart? For in my heart I wish to give so much to everyone, but without incurring financial strain, encouraging the clutter of stuff, and widening the divide that lies between those who have and those who have not. So much mental debris is created when we feel obligated or expected- divides between rich and poor, imbalances of wasteful and scarce proportions. I want to give beyond these limitations, I want my gifts to reflect my genuine motivation to give honourably and without insult or suggestion, without waste or support of the factorization of cheap, environmentally harmful stuff. I hope that handmade tokens, second hand presents, and gifts of food is simply enough. I would stuff the stockings with brain teasers and jokes, art activities and clues to scavenger hunts, or with games that involve piecing together something from each persons stocking. Personal challenges can be created and tucked in for each person, and perhaps can lead to finding a hidden gift. Things that would keep us all giggling and silly, that keep the laughter and festivities alive throughout the day instead of the short-term, rip-it-open-and-move-on-to-the-next-thing method. I loved the stocking moment when I was young, but I can’t seem to bring myself now to buying tons of little plastic things to quite over stuff everyone’s stockings. Activities and collaborative team efforts to create fun and beautiful moments are the best thing I can think of to replace a huge pile of presents that get torn through before breakfast. I struggle with the waste of cut trees of Christmas, and have created an annual tradition of building a tree by gathering large branches that have blown down on our property and standing them upright in a bucket of water, supported within a bamboo frame. We collect different kinds of fir and cedar, and I give a blessing of thanks and respect to the diversity and importance of the life-giving forests of our island and around the world. And what of the foods of Christmas? How do I shed a blanket of love over the cooking of Christmas dinner? Slow food all day, long meals made with many hands, vegetables infused with the luscious flavors of patience and love. Conversations shared over chopping boards and simmering sauces, laughter spilling like warm drinks and fresh fruit. 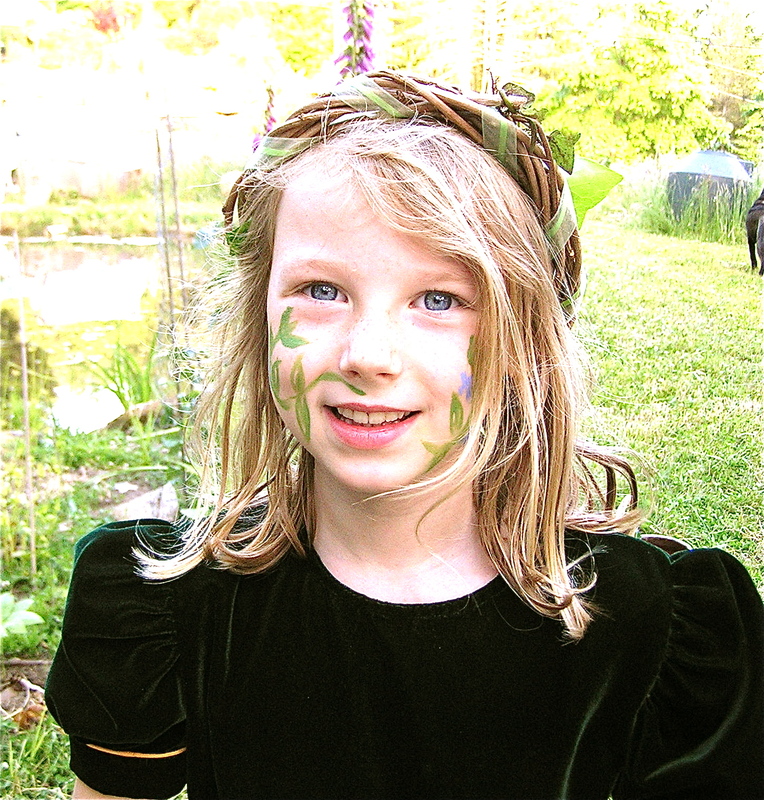 A variety of children’s head levels skirting and giggling in wild joy. Hands passing glasses and plates as if these everyday objects are in themselves, gifts to be given and received. Eating only what is needed, and savoring each bite with gratitude, sending prayers of abundance to each corner of the world. It is important for me to venture out into the winter world no matter what the weather is. To walk together in the fresh crisp air and remember that the hearth of my home is also the hearth of the earth and of the global interconnectedness of the living world. Humanity, since our slow beginning, has shared the same air molecules as every animal, plant, tree, insect, bird and fish that has ever lived on the earth, renewing and recycling the very particles that bring life into our lungs and blood, just as it brings life to the leaf cells and sap of the towering, ancient trees and young shoots. Warm hands in mine, I want to walk through gusts, rain, sun, snow, cloud and mist, breathing in the beauty of the air, the abundance of moisture, a giving and receiving in every breath. Sharing the crisp and glistening air and feeling the world together, the sense of home expanding into the heavens and into the soil waiting quietly for spring. The birds snapping up the clusters of seeds heads and worms that wiggle and sway- I want to hear their joyful songs and know that their melodious calls are gifts enough. But what if I cannot do all these physical things? What if I had no time to hand make gifts, no money to buy games and food, no home even to wake up on Christmas day? What if my family was gone, or I had none, or those that I had did not feel the way I do or share the same motivations and values? What if I was limited in any way from practicing these physical rituals that reflect my emotional values…could I still hold these energies of Christmas and feel fulfilled? Could I still be warmth and love, connection and beauty, joy and gratitude and giving? How would I show it, share it, offer it? How do I create physically that which I feel energetically if my physical world is not such as it is- perfectly privileged? We are spiritual beings first, having a physical experience, but it is through our worldly ways that we express our spiritual energies and needs. I suppose this is the constant challenge- to meditate deeply in the midst of chaos, in noise and pollution and different opinions, judgement and poverty. To emanate my center of peace and love, and offer it to any who may wish to take it. It is a luxury that I can consider it an easy possibility to create my ideal vision of how I want to surround myself during the Christmas season, that I can freely try on and rearrange the comforts of life that fit exactly into my spiritual center. I understand, though, the danger of being dependent on the perfect setting to achieve such peace. 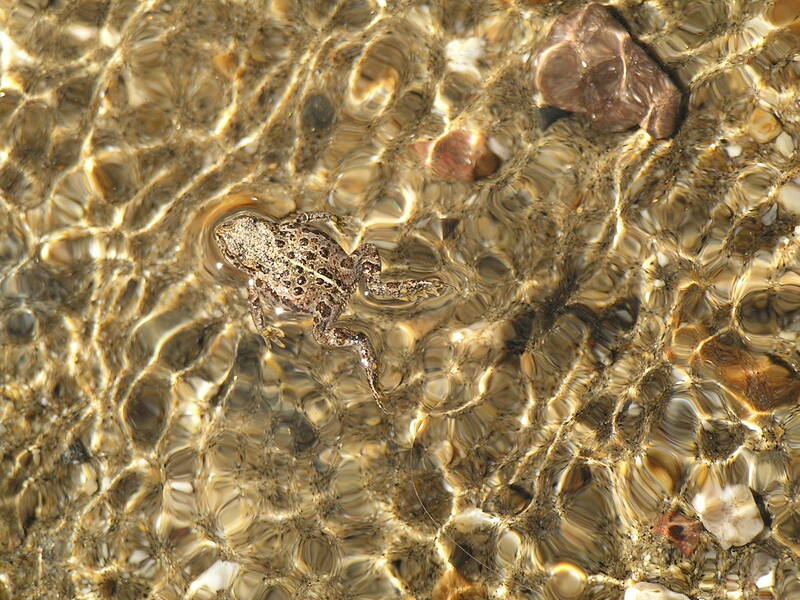 I am swimming, floating even, in gratitude that all I write about is completely possible for myself and my family. It is my wish that I can be surrounded by friends and family who share in this longing for connecting with each other, to bring with them a desire to share love and generosity, to be willing to be openhearted and tender, and to rejoice in festivities. I want to be bursting with life, and laughing with tears, and saying thank you, thank you, thank you, for being who you are, and to have eyes to look into who say thank you, thank you, thank you, back. I send out prayers that there will be this same luxury and privilege for everyone- to create for themselves a season of celebration that is an authentic reflection of the beauty of our hearts and spirits, filled with love for one another, and feeling the true peace of the world. I celebrate the spirit of giving with my hands and with my heart. I celebrate the spirit of beauty in nature. I celebrate the spirit of joy with laughter. I celebrate the spirit of light with candles and with my own internal source of divinity. I celebrate the spirit of abundance with gratitude. I celebrate the spirit of love with eyes and hands and prayer. This is my offering in any place I may be, with whomever I may be with. One of my favorite newsletters that I receive is from Carol Ann Ciocco, of www.threemoonocean.com. She sends out letters at the times of the New and Full moon, the Solstices and Equinoxes, Eclipses, as well as at other times of significant change either on or above our little planet, relating the energies of astonological shifts and alignments with historical facts, religious influences, and scientific metaphysical impulses. Her writings are very clear for me, even though I am not at all a seasoned astrologer or astronomer, and I am always left with a deep resonance of influence and connection between myself and the vast workings of the universe. I decided that for the New Year celebration, this was all that I needed to know, this newsletter below explaining the positioning of the beautiful star Sirius and it’s secret companion. I have been learning more and more about the swirling stars with my children- information from the very factual to the very mythological, and we all seem to find an enthusiasm and joyous wonder at the night sky and it’s cycles. I hope you enjoy this letter by Carol. Around mid-night local time on New Year’s Eve the triple star Sirius (the brightest fixed star in our sky) is found directly overhead on the mid-heaven infusing the earth with its starry energy. Because Sirius is the brightest star in our sky, in antiquity it was known as The Shining One or The Scorcher. The Egyptians called Sirius Isis and built their calendar around the rising and setting of this magnificent star. In addition, the Egyptians felt that Sirius could bring immortality to humans. Freya Owlsdottir shares this info about Sirius: “The Sirius system is directly “upstream” of our solar system within the galactic arm of our Milky Way Galaxy. Because of this, we now know that the polarized energies of Sirius do indeed wash over us. 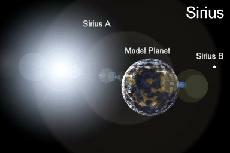 By coming directly towards us, Sirius creates an axis of rotation with Earth relative to the stellar background. Because of this, of all the stars in the sky, only the annual heliacal rising (meaning its visible rising just before the Sun) of Sirius exactly matches the length of our solar year, 365.25 days. Even today, unbeknownst to most of the people of the world, our New Years Eve celebration is a celebration of Sirius’ presence directly overhead at midnight. Around January 1st, this midnight alignment marks the moment when the energies of Sirius most closely touch our lives in their most singular purity. Without knowing the hidden reason, we mark this midnight moment by jumping for joy as the rush of this vital connection surges through us. To be in conscious attendance of Sirius’s positional relationship in the midheaven at midnight enables us to receive the empowerment of the Spirit of Sirius directly into our lives. Sirius is a double or binary star, (the Dogon peoples of Africa have maintained for centuries the existence of not one, but two companions of Sirius, even long before astronomers were able to telescopically perceive the now-acknowledged companion known as Sirius B.) This companion to Sirius is a very dense and small star that, nonetheless, has immense impact on the rotational pattern of Sirius. In their dual gravitational pull upon one another, Sirius and its companion form a beautiful spiral dance. As they rotate relative to their respective gravitational fields, Sirius and Sirius B are observed to twist around each other in a helix-like spiral that has, over the course of its 50 year cycle, the expansive/contractive design of the Golden Proportion. The Golden Proportion is a geometric pattern that is evident in all natural forms, from the seed-heads of a sunflower to the relative proportions of our own bodies and the motions of hurricanes. The key word to describe Sirius energies is TRANSFORMATION. This is the gift of mastery that Sirius flows to us at this time. One of the tools for mastering this gift is the use of Sacred Geometry and the Morphic Fields of perfection. The Morphic Fields contain the blueprint for all physical form in its penultimate and perfect expression. This may be why the Egyptians linked Sirius with immortality, as Sirius holds the codes of perfection that exist in the 6th dimension. These forms will always be there, even if something on earth becomes distorted or even extinct. The Golden Proportion is eternal, and even if our thoughts and actions distort our bodies, our minds, even our souls and our Planet itself – the ideal of perfection is always held available to us if we choose to allow it to return. It is from this field that we create physical form through the use of imagination and visualization. When you see something as perfect, you are accessing these fields to then activate what you see into physical form. So, as the ball drops over Times Square, so does a blast of energy from Sirius, “The Shining One,” for the creation of perfect and beautiful expressions on Earth. Allow Sirius-magic to infuse your new-beginning visualizations into form. Unity and trust come from knowing that we are not separate from the creative forces of the universe. I would like to celebrate the unification of all living beings of this great universe, to the oneness that we all are, to unity. Knowing deeply that we are created from the same matter and energy that began the universe, the galaxy, and the planet is a step in understanding that we ARE creative energy. By allowing this flowing of creation to evolve the quality of our lives and the life of that which sustains us, the earth, we can dream into being the solutions for the challenges that appear around us at this time. We cannot do this alone, however. We already understand the power of a collective, the magnitude of multiple and millions of us joined together. I believe in our abilities as humans to lift the ego’s and dualities of the places that we are at this time as humanity, bringing us to a oneness with the source of divine energy and so living our daily lives with peace, joy, and equality. 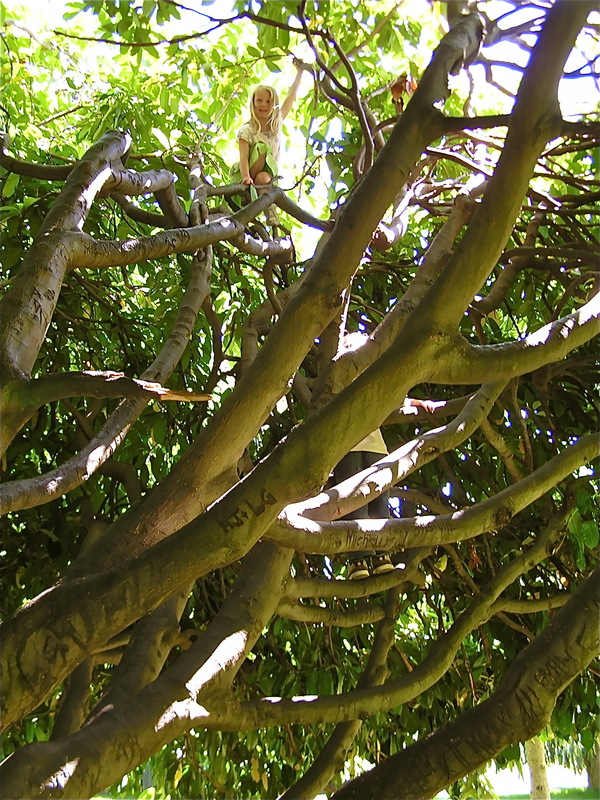 There are many branches that lead us to the light of the open sky. This will require a restructuring of the basics of our values. In the past, groups of people living together functioned under a set of common values that guided how those people communicated, used and shared resources, ate, developed relationships, and conducted spiritual rituals. Today, our values can be so vastly different from every one of our neighbors that we have become isolated in our communities and enveloped in ignorance, fear, or judgements about who they are and who we are. Who is right and who is wrong? Who is capable, worthy, rich, lucky, smart, and who is not? We see these values as the defining qualities that make us either good or bad, or somewhere in between. These limitations become the lens in which we view the world and everything in it, including the ideas that separate spiritual beliefs into religions. Separating ourselves from each other in this way leads millions of people down the road to depression and anger, isolation and judgement. But really, we are born with the solution. We come into this world from the source of our spirits merged with the source of the spirit that created us. In our most intelligent and intuitive state, we chose the parents we needed for this journey of physical being. We are teachers, even as we first emerge. We come loaded with trust and purity, with energetic receptors and unconditional love. But we are also sponges, absorbing the words and energies of everything around us, capable of amplifying and mirroring our influences. As we grow into adults, those influences become our lenses as well, whether we follow the same limitations or abruptly turn away from them in protest. We are beings of emotions and senses. We cannot help but feel. We take on, through sight and sound, through touch and taste and smell, the emotions of the world. We are not meant to be shut down, to be limited, to be programmed. We are the expression of the emotions that we connect with and empathize with if only we are allowed to. It is through these levels of expression that we process the emotions that rise and fall, and so turn emotions into revelations. Revelations in turn spark the next steps of our actions, which become offers to those around us, gifts that may be taken up and integrated into someone else’s expression. Good and bad become the same thing- moments that shape us with opportunities of expression and deeper understanding. We are all in different stages of this process. Unity does not mean that we will cease to feel the turbulence of living. It seeks to erase the lines of separation, and so cushioning each of us with a secure knowledge of belonging and worthiness in the light of divine love. With this understanding, compassion blossoms, and so too, the doors to unconditional love and the return to our inner child. that was yours at birth and that can be yours again. with the world around you, is still within you. Once I began sprouting my ideas, I was committed – my vague thoughts found roots in Anna and Tim’s soils of visualization. We brought the theme of magical wood folk for everyone to dress in, and extended invitations to those we thought would like to take on a role during the evening. We spent a day clearing a walking trail through the forest of our property, and raked up the piles of grass that our neighbor Lester had very timely scythed for us. 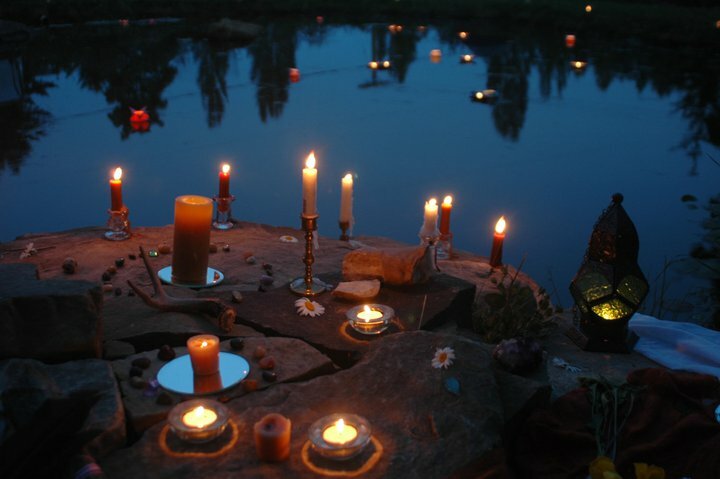 We set up a place on a flat rock beside the pond where Joanne created a solstice altar, and we invited everyone to bring something to add to it during the evening. 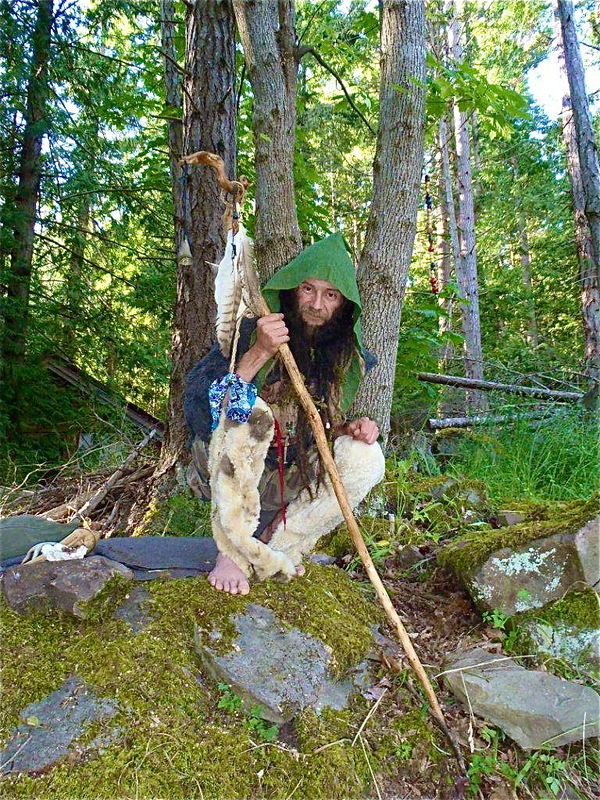 Then, after we all gathered in our magical wood folk attire in a circle of almost 50, we began with a simple meditation of grounding and listening. As the sounds of the evening birds filled the still sunlit air, it occurred to me that I had suddenly come into a role that I had never imagined in my intentions, but that felt natural and easy despite my total lack of experience in leading a meditation to a large group and speaking about the energies of summer solstice and how we can reflect on our inner journeys at this time. I had tried to do some writing as to what I thought I might say, and just couldn’t get it right. 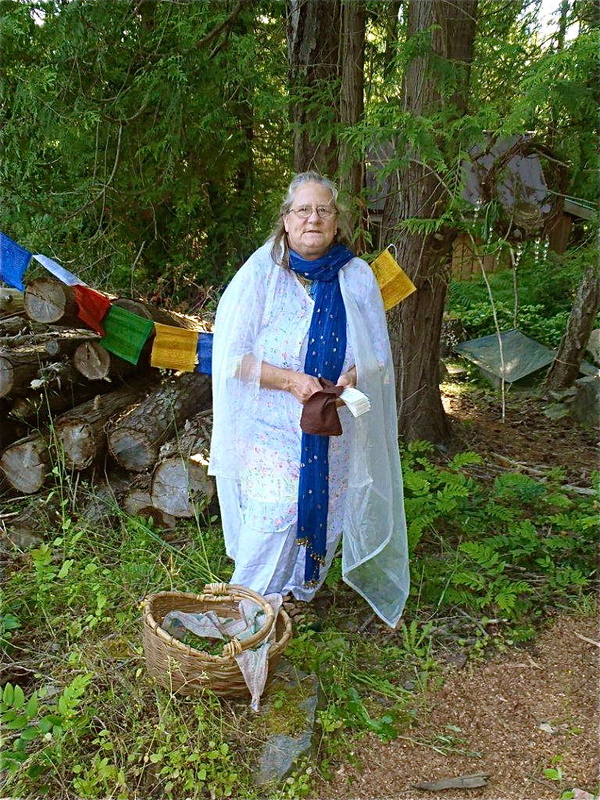 But for three days I had been listening – to my inner dialogue, thoughts, revelations, and insights to help prepare myself for the time of this ritual, although it had been for my own reasons of understanding, not because I saw myself in the role of the “grand ma’am” speaking to everyone else. There were things I forgot to say, and I tried to keep things short and simple so as to include all the children while engaging the contemplations of the adults. We started with the time of the winter solstice when our ideas were the seeds of our dreams, and everyone received a piece of cloth and a stone. 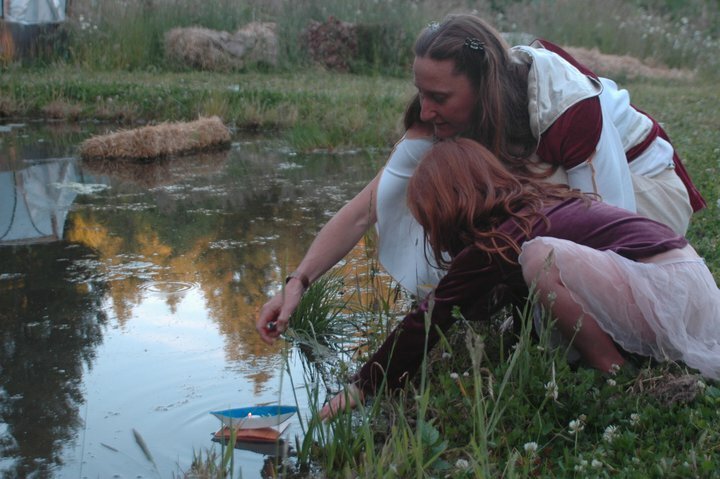 We began our journey around the pond, contemplating the energies of germination. At some point, we tossed our stones into the universe of the pond, and watched the expanding rings of our ideas begin the chain of action. Then we followed the trail into the forest – empty, and ready to receive. 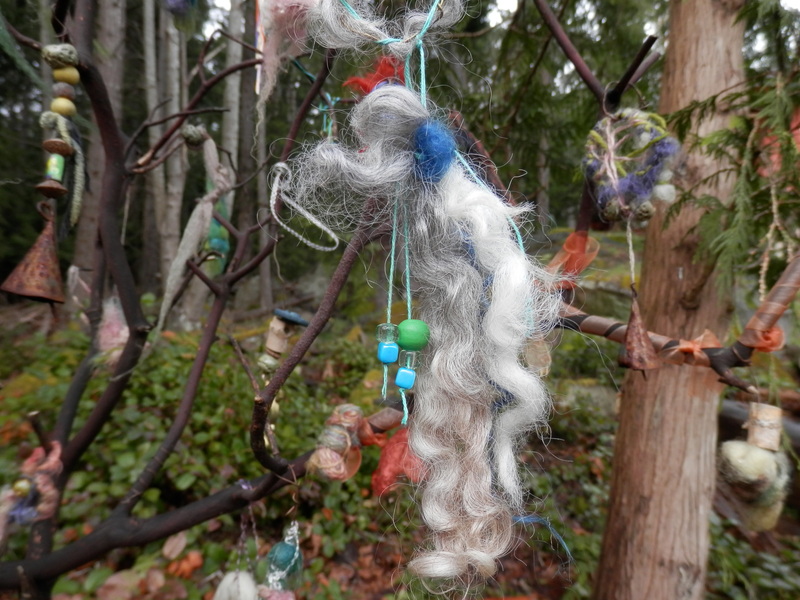 Along the trail, we met with a variety of beings, each offering a gift with a message. There was a young man of the moss with a message of grounding, and a grandmother with rosemary and the words of remembrance and love. 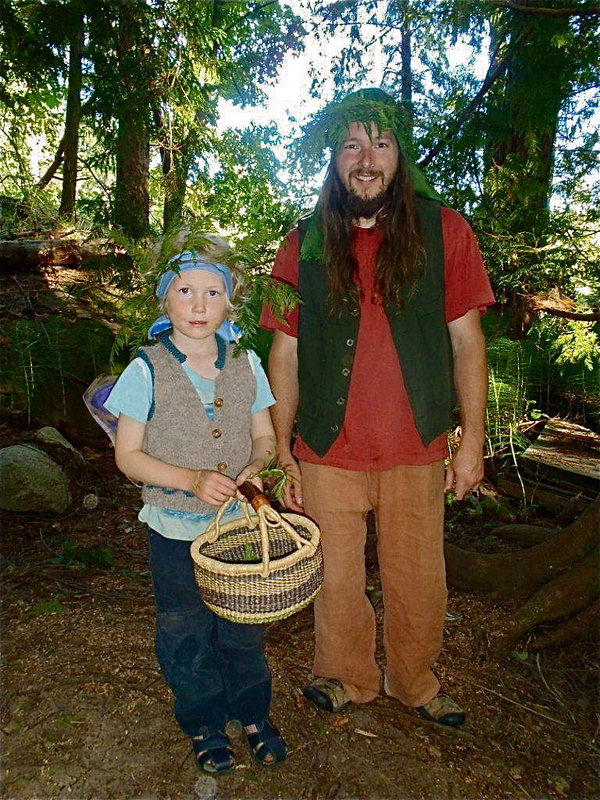 A father and son gave cedar, for strong roots and a soaring spirit, and two sweet girls gave fennel for joy. In a clearing there was a woman that danced and soared with the abundance of summer grain, and finally, a beautiful mother with the gift of wild rose in beauty and heart. We explored the trail and the little treasures along the way with giggles, in contemplation, with friends hands’ near by, and with eagerness to explore. As everyone emerged back where we started, a simple song greeted and invited new voices until all of us had returned with our gifts. Lastly, we sent around a long white ribbon which everyone held onto – amazingly this spool of ribbon ended exactly with the circumference of our circle. I invited everyone to take part in offering a word into the circle that described a world they deemed as sacred – so that collectively we would create a vision of a healthy, life sustaining community in which to live. It could have been endless, I am sure – ideas cascaded into each other as we all threw inspiration into the vision – flowers, trees, birds, hugs, tears, bears, watermelon, ice cream, lego, leaves, star wars, space, the milky way, ice cream (again), friends, mothers, fathers, babies, beetles, clay, sand… all imbued into the white ribbon we all held. Finally we went around and cut the ribbon so that each person had a little piece, which became a perfect tie for keeping together our gifts in the piece of cloth. In this way, we sent out our individual dreams, collected skills and gifts, then came together in a group to share and build a world that supports each of us and our goals. Then we feasted! After dinner we spent some time folding origami boats and boxes with the help of the Kikuchi family. 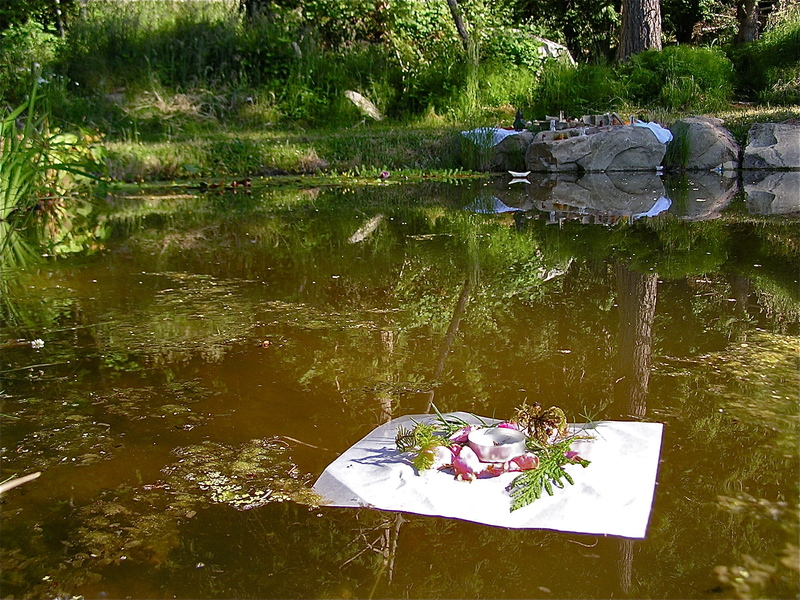 We placed them on small squares of cedar wood, put a tea light candle inside, and sent them off on the pond with wishes and prayers. We lit the altar candles, started up a fire, and got out some instruments. Everyone made a fine effort to stay up to see the Milky Way, but eventually families and neighbors drifted back to their beds. Except for us and two other families – we pulled out our sleeping bags and spent the night gazing at the crescent moon as it made its way across the late night sky. It was indeed a beautiful beautiful night. I am so happy to be finally opening up our land in this way. This was the first gathering of any kind we have had since all the excavation took place three years ago. The pond is alive with plants and bugs, the marshy field is dried out and level and ready for orchard plantings, the piles of construction scraps have been cleared away. We have laid the groundwork for our sanctuary, and I am sure it will continue to change, grow and flourish with the cycles of the land and seasons as will I and the community of family and friends around us, in support and in celebration. Thanks to Joanne and Kenta for some of these photos. 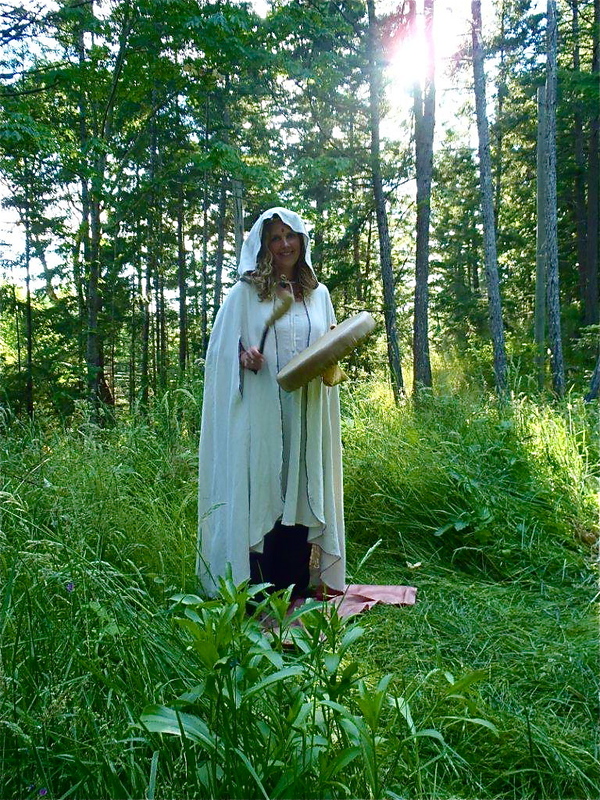 Ideas for this ceremony were learned from Earth Wisdom – A Heartwarming Mixture of the Spiritual, the Practical, and the Proactive, by Glennie Kindred, as well from our own imaginations and experiences. 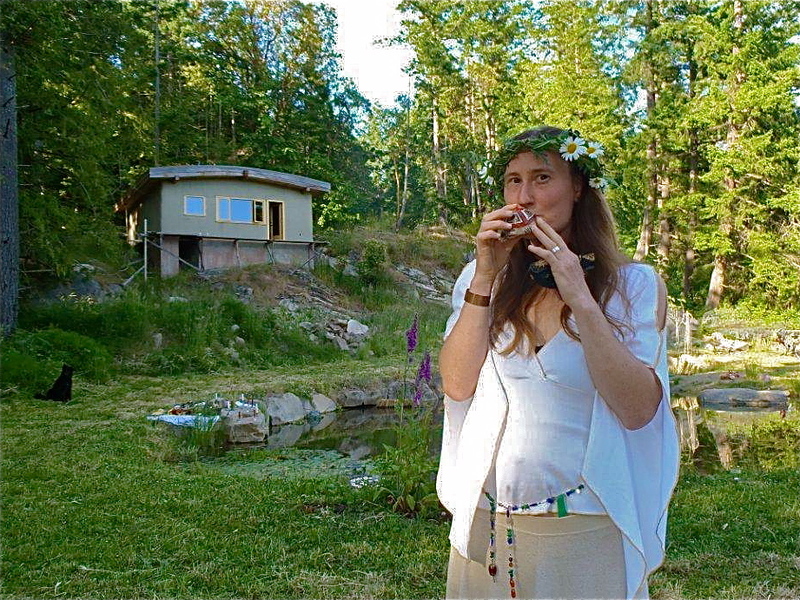 On Pender Island, we have just begun dancing again. I am sure that, looking into the long past, there have been many days and nights of such dance in these forests. In the 5 or 6 years that we have been gathering to dance- through a few different forms and names and coming and goings of people and numbers- our intent has always been strong in holding a judgement free zone of sacred honouring through movement, writing, drawing, meditation, yoga, the many facets of creative expression. It took awhile to get going really, in the beginning we were all struggling a little to find out what actually fit- music was a little off, or nobody would have a key for the hall, setting up the sound gear was hit and miss. Communication and organization really- but when it came together we understood the greater reason for persistence. What we needed was a leader, a guide, who had great music and themes of contemplation, someone to give us some ground to leap from, opening us up to the possibilities. Our friend Nicola stepped forwards- she was only just beginning herself, exploring 5 rhythms dance workshops, and having a willingness to test her own waters about facilitating such a space. She gave us inner explorations, and outer excercises like witness dancing, mirror dancing, spoken word dancing- she gave opportunities to really throw down the barriers and be exposed to ourselves and others in trust. 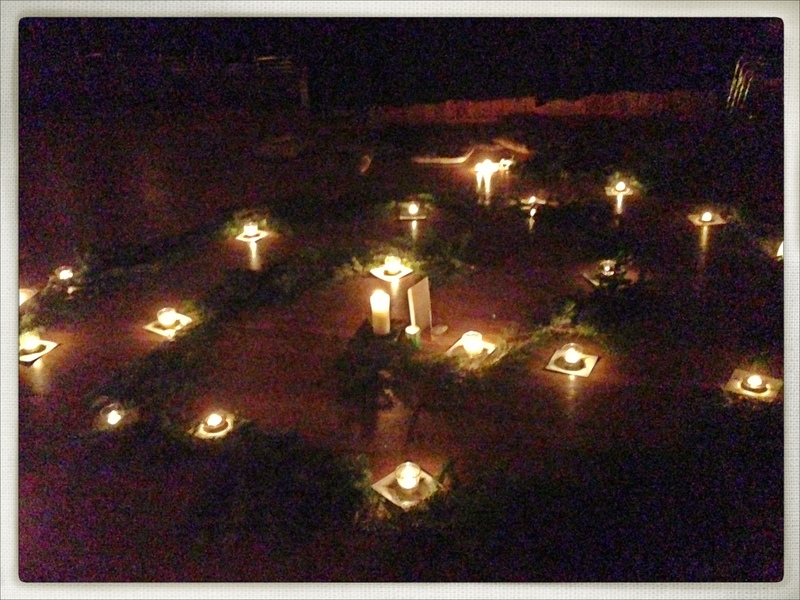 She also instigated the altar- candles, colours, thematic objects, cards, paper and pencils. In and out of a few years, Nicola led us through her own discoveries until just last year, when she moved to a neighboring island with her family. A few of us knew at that point that dance nights would not end because or guide was gone- but that we were ready to step up with the tools needed to continue to offer the same space to those who would come. While we are not offering the deep guidance that Nicola had, we are opening the space to a collective presence- much like we first envisioned but stumbled to achieve in the beginning. We invite women and men, young and old, anyone who is wanting to be in this space and uphold the sacredness. 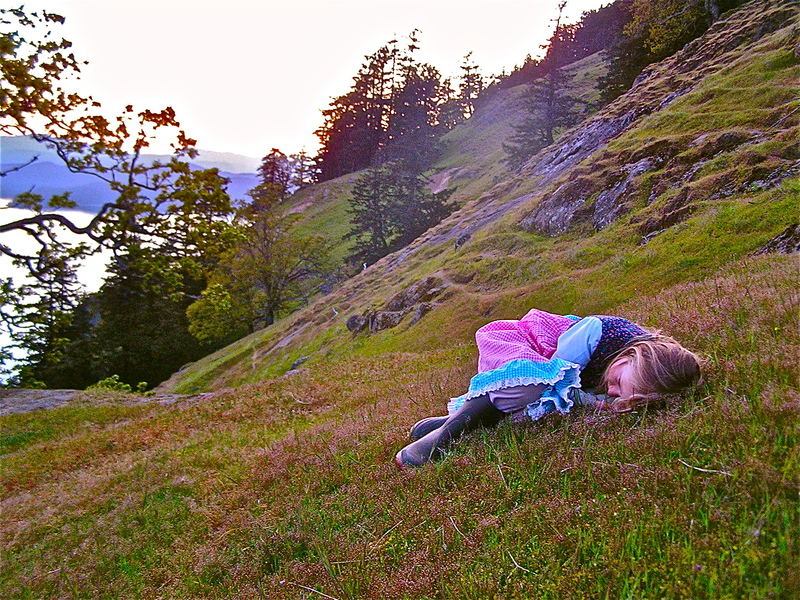 People can sit, lie, stretch, write, draw, paint, or just breathe. We accept anyone who would like to put together the playlist for a night, with or without a theme. Our music is always diverse with everyone’s individual musical style, and as we share, it expands us all. We keep a “library” of past playlists available for copying, and it is not unusual to hear a song pulled from those past nights. We are creating a wide foundation of music. The building of the altar, which is usually taken on by whoever is doing the playlist, (but doesn’t have to be) holds us together in beauty and sacred meditation, and allows any discussion of revelations, epiphanies, heart murmurings, or places of shadows. We have explored earth, air, fire, water, solstices, passion, joy, healing, forgiveness, innocence, gratitude, the cosmos, and whatever other energies develop throughout the year. Recently I read an idea put forth by Dr. Masaru Emoto, which said, “E=MC2 really means that Energy = number of people and the square of people’s consciousness.” I have felt this to be so true during dance many times, that our collective energies are more powerfully charged when we move together, when we feel together, when we love together. It is infectious. 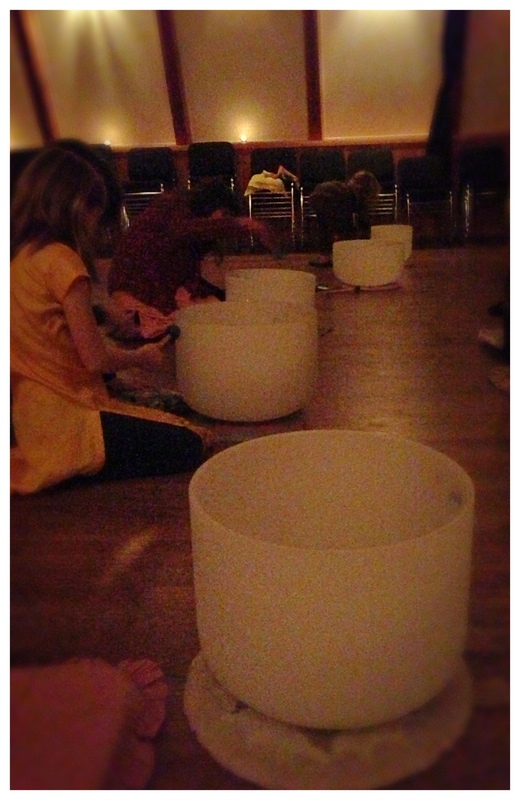 We have held healing circles for friends, sent prayers to far away places, and chanted sanskrit mantras together. We laugh in shared stories of our lives. It is a small island- we are all connected in ways outside of these nights- in other groups, in professional jobs, in the roles we hold in our community. I think it is brilliant that another layer of our interactions is open in the sacred way of this creative space- may it lead to a deeper honouring of each other in every day. We are not a huge group, by any means. I have noticed though, that since december 2010, our regular average has gone up from around 8 to 25. It is not many still, but it makes the community hall where we dance seem like a maze of bodies to weave through. I think the foundation is growing. I think there is an awareness that collective consciousness, stemming from our individual self care and love, is simply just a good thing to do. Release and refresh. Dance and be danced. I would like to send gratitude to those people and forces that have helped shape these beautiful evenings along the way with such a natural procession of growth and evolution. May the journey continue.